Patrick Square Pharmacy is a new independent pharmacy located within the Town Center of Clemson’s latest development, Patrick Square. Patrick Square Pharmacy is the evolution of three partners that saw a opportunity to provide outstanding, caring and courteous patient care in a unique setting surrounding the Clemson area. We look forward to being an empathetic ear when you need help understanding the complex world of prescription drugs and insurance drug coverage. 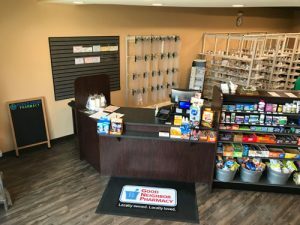 Please stop by Patrick Square Pharmacy and let our helpful staff guide you through the maze of options dealing with drug pricing, co pays, deductibles, interactions, and your prescription regimen. Brock, Laura, Lionel, and Kelly look forward to being your primary source for your pharmacy needs. Patrick Square’s Town Center is rapidly becoming one of the Upstate’s most attractive locations. Convenient to drive to, and an easy walk for Patrick Square residents, the Town Center offers a variety of leasing space in historically-inspired, green buildings.